This is one of the best and most traditional of all the recipes for Christmas Pudding or Plum Pudding, and rewards being aged for a few weeks. 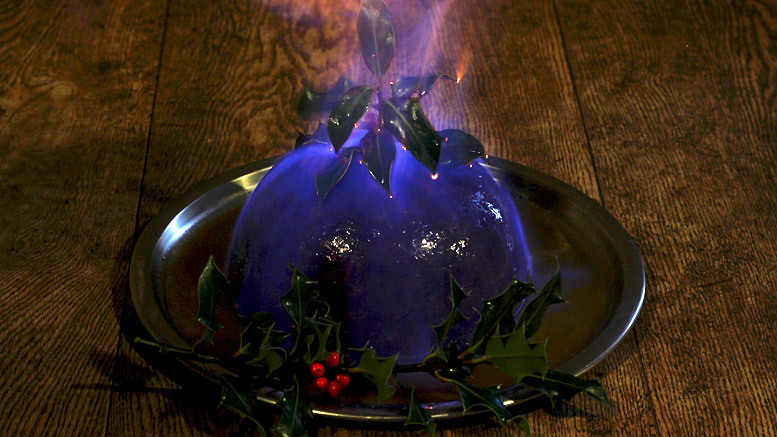 The triumphal entry of the Christmas Plum Pudding, topped with a sprig of holly, and alight with the flickering blue flames of burning brandy, is now the traditional highlight at the end of the Christmas Dinner, thanks in large part to the description of this moment by Charles Dickens in his 1843 Christmas story, ‘A Christmas Carol’. 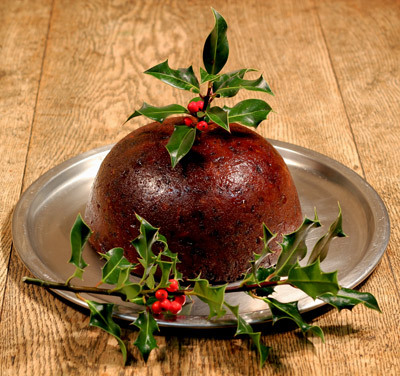 The following quote admirably shows how devoted the British are to their Christmas Pudding and how much other nations are equally baffled by it: “The plum pudding is a national dish, and is despised by foreign nations because they never can make it fit to eat. In almost every family there is a recipe for it, which has been handed down from mother to daughter through two or three generations, and which never has been and never will be equalled, much less surpassed, by any other… It is usual, before sending the Christmas Pudding or Plum Pudding to the table, to make a little hole in the top and fill it with brandy, then light it, and serve it in a blaze. In olden time a sprig of arbutus, with a red berry on it, was stuck in the middle, and a twig of variegated holly, with berries, placed on each side … If well made, Christmas plum pudding will be good for twelve months.” From, ‘Dictionary of Cookery‘, by Peter Cassell, published 1875. Adding In Luck To The Christmas Pudding: Another important addition to the mixture of this Christmas Pudding Recipe is an old silver or gold coin, (fully sterilized) which is cooked in the pudding. It will hopefully bring wealth in the New Year to whoever finds it on their plate on Christmas Day. An old silver sixpence is the traditional coin … but either a modern small silver or gold sovereign coin should still be used today. Re-use the same coin each year. Just make sure everyone knows it’s there and warn them to look out for it when tucking in to the Christmas Pudding. This Christmas Pudding benefits from being stored and matured for several weeks before serving, the flavours can mellow and mingle, making a deep and resonant tasting pudding. This Christmas Pudding serves over 10 people and is made in a 2 litre pudding basin – but instead of one large pudding basin you can split the mixture between two smaller 1 litre basins, steam them and then keep one for yourself and give the other one as a gift. 50ml of Brandy and Vodka, to set the pudding alight. A sprig of holly, with a few red berries on it. The night before: Wash and rinse in cold running water the currants, sultanas and raisins, then leave to drain. Once drained place all the fruit ingredients for the Christmas Pudding from the first group of ingredients into a non-metallic mixing bowl. Stir in the grated orange and lemon zest and then add the juice. And finally add the stout (Guinness) and mix well. Cover and leave overnight in a cool place. The dried fruit will plump up with the alcohol and fruit juices in the night. 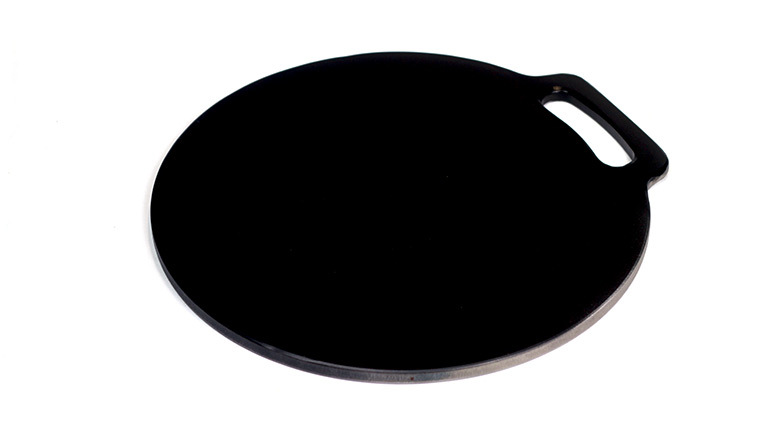 On the following day: grease a large 2 litre round pudding basin (or two smaller 1 litre ones) with butter. In a very large mixing bowl mix in the flour, suet and breadcrumbs. While in a separate bowl beat the eggs with the brandy, then add this to the flour, suet (you can use a vegetarian substitute if preferred) and breadcrumbs, stirring it in a little at a time. Then in stages add everything else – stir in the sugar, salt, and spices, the chopped almonds, grated carrot and apple, etc. and then everything from the overnight bowl of fruit and mix well. Make sure all the ingredients are thoroughly mixed in and there are no clumps of single ingredients. If the mixture is a little wet add in some extra plain flour, if a little dry add in some milk. The mixture should be of a soft ‘dropping’ consistency, i.e. the mixture is not too sloppy but will drop off the spoon when tilted. Add the silver or gold coin if adding, and it is at this stage everyone in the family should give the pudding mix a stir for good luck. Once at this stage spoon the mixture into the prepared pudding basin. Spoon the mixture into the greased pudding basin, and pack it down a little, level the surface with the back of the spoon – the level of the pudding should be about 3cm (1.5 inches) below the top (or less) of the basin. I like to use an oven-proof clear glass pudding basin so that I can see what is going on during the steaming time and later on how it is maturing. Cut a round, large sheet of baking parchment (or greaseproof paper) and one of foil slightly bigger so they will come down at least 10 cm (4 inches) over the sides of the basin. Lay the baking parchment on top of the foil and fold a large pleat down the centre of both (to allow for any pudding expansion). Lay the sheets over the top of the pudding basin (foil side up) and secure around the sides with string – wrap the string around the pudding basin several times tightly and tie the string off to make sure the foil top is secured down firmly and the pudding is sealed. Trim off any excess foil and paper if it is too long. You can even make a string handle by looping it over the top and tying it off under the string going around the basin. 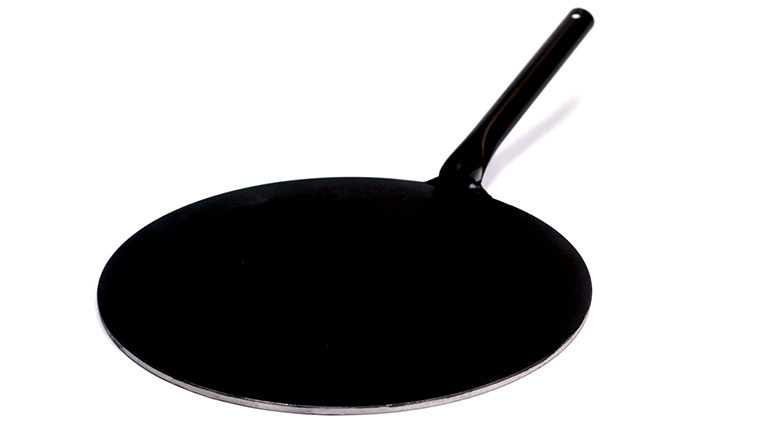 Stand the pudding basin in a deep saucepan (which has a tight fitting lid) on an upturned heatproof plate (or metal bars etc.) 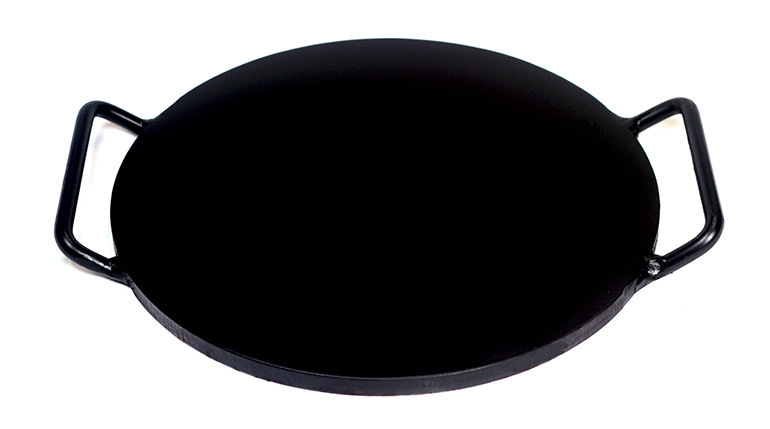 to raise it off the bottom of the saucepan – add a little water under the plate to get rid of any air pockets. Pour in boiling water to come just under half way up the side of the pudding basin. Keep the water at a medium simmer and a gentle bubble, cover with a tight fitting lid and steam for 7 or 8 hours, topping up with boiling water from time to time. It is important to keep checking the level of the water so that it does not run dry. After the allotted time spent steaming remove the pudding basin from the steamer or saucepan and allow to cool. When cool take off and replace the foil and greaseproof paper top with some fresh sheets and re-secure and seal – before sealing drizzle over a little extra brandy. 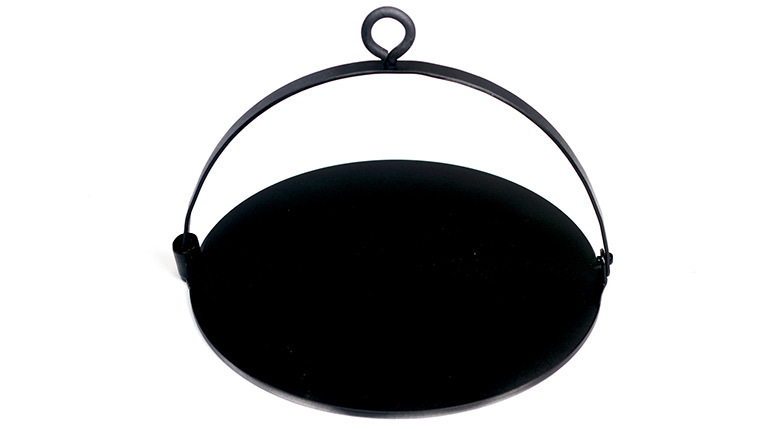 Store the pudding in its sealed pudding basin in a cool dark place until Christmas Day. On Christmas Day you will need to reheat the Christmas Pudding by steaming as before for 2 to 3 hours. Then remove and uncover the pudding basin, carefully turn the Christmas Pudding out onto a serving plate. To serve: If setting the pudding alight it is often best to use a metal tray or plate with a lip to sit the pudding on and contain the lighted brandy as it is poured over … add a small sprig of holly with berries into the top of the pudding and take the pudding to the table, (it is better to light the pudding at the table rather than carrying it in). In a small saucepan warm some brandy and vodka, (the vodka ads a higher alcohol volume to increase the time of burning). Gently heat it through so that it is steaming. 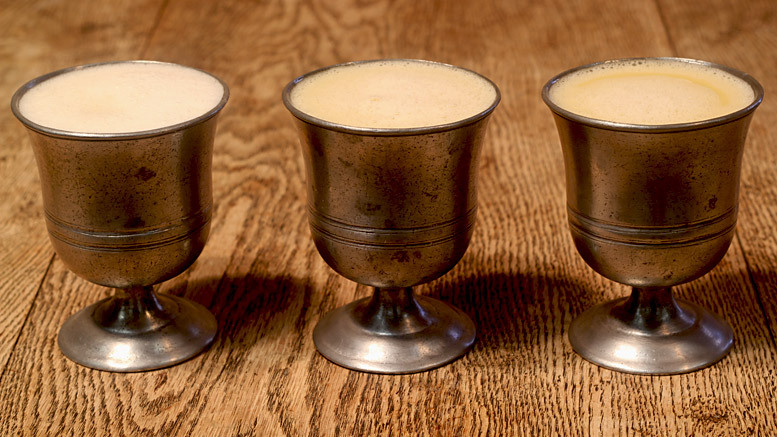 Using a lighted taper light the rising vapours in the saucepan, dim the lights and pour the lighted brandy and vodka over and around the pudding – it will only remain alight for a short time, then cut into the pudding. Use a knife to cut the pudding into slices and turn the slices into bowls – serve with Brandy or Rum butter and/or Vanilla Custard, according to taste.